We all know that adage "New Year, New Me", or the other "Out with the old, in with the new". However, for the new year I decided to go with, new year, new bedroom. My master bedroom is "nice", but it's always been missing a certain oomph. When we purchased our home a few years ago, there were all these plans that I wanted to put into action. My major focus however was upgrading the kitchen and the bathrooms. While the bedroom is where I spend most of my waking moments we decided to not go overboard in terms of buying furniture etc. I've always been a big fan of IKEA® and I'm always amazed at their decorating skills and how they're able to put so many items in a small space and still manage to make it look exquisite. Since our focus was our kitchen, I had very limited funds to furnish my bedroom, so I purchased their Malm 6 drawer dresser and nightstands in black/brown to go along with our black metal bed that we've had for many years. However, this year I knew I wanted a change. Something different. New Year, New Bedroom! This post is in collaboration with O'verlays®. However, all opinions are mine alone. I originally wanted to purchase brand new furnishings for my bedroom, however, my husband the penny pincher said "why get rid of them if they're good, just spruce them up". And that's exactly what I did! With help from O'verlays® that is. O'verlays® can transform your furniture taking them from drab to fab. I was so excited when I did my first nightstand and got so caught up in the transformation that I almost forgot to get a before photo. Before I show you my transformation, let me tell you all about O'verlays®. 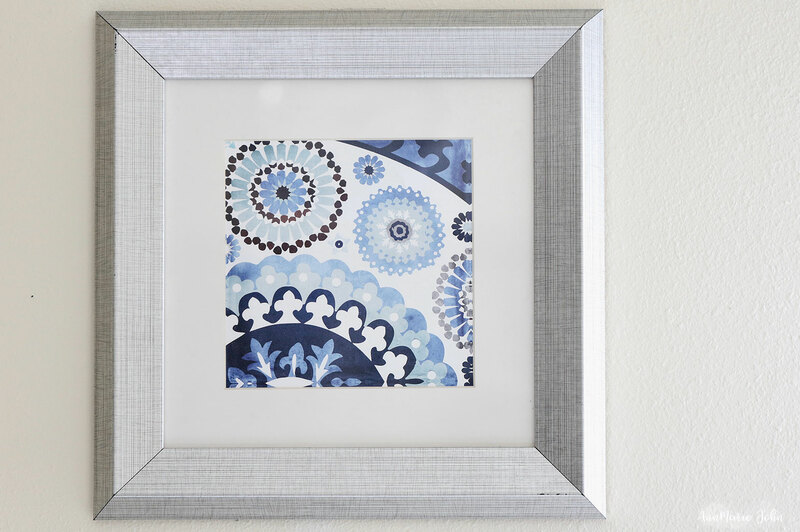 O’verlays® are decorative fretwork panels that come in several patterns and sizes. They are light weight, paintable and easily attach to furniture, doors, walls and glass. Customize your furniture and accessories with O’verlays® or use O’verlays® Kits sized to fit many of IKEA® and other popular furniture. My bedroom was rather boring. There was a lot of black everywhere which made it rather dark at times, and it didn't seem to help much with my moods. This year I decided that I wanted to make it a little more open and bright. I wanted to add a bit more color, but not overdo it. As you can see above, I had a black bed complete with my Malm black/brown dresser and nightstands, and even our lamps were dark. For my old room I wanted it to remind me of the Caribbean so I had tropical artwork and a vine floral decal, but I wasn't impressed. I did a complete overhaul, but first I had to decide on a color that we could use to complement the rest of the room. Eventually I decided on blue. 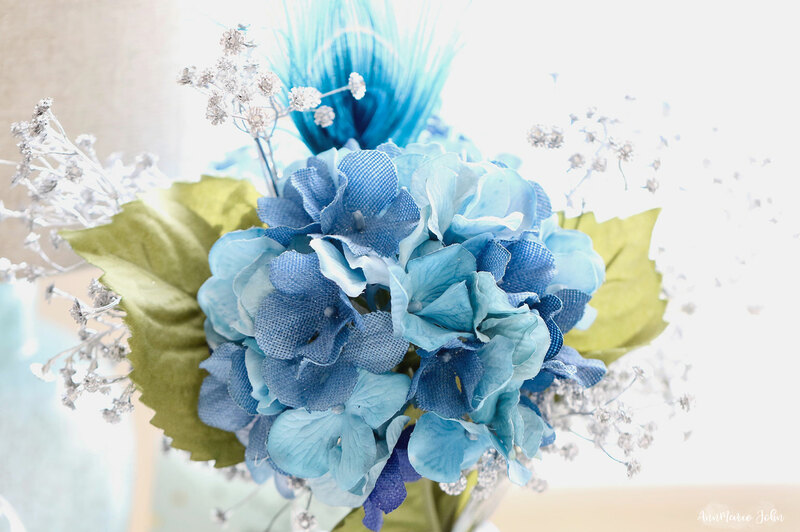 There is such a vast variety of colors where blue is concerned that it was easy to incorporate the range of colors. I also got rid of our bed which was in amazing condition I should say, but I wanted something new. While I wanted white, my husband wanted something darker, so we both compromised and settled on a dark grey leather tufted bed. I also did a his and her side as I'm into reading books at night, while my husband is the one who hogs the remote. We also wanted to focus on our family so did a collage of photos over our bed with the theme reminding us to "Cherish Every Moment". We decided to get O'verlays in Ruby and I LOVE them! Now throughout my excitement I got so carried away with how easy O'verlays® were to apply and how amazing it looked, that I totally forgot to take a before picture of my dresser. However, you can find my exact dresser on IKEA's website. My original intent with my dresser was to resurface it to a white finish and then paint my O'verlays® in a tiffany blue color. Yes O'verlays can be painted in whatever color you desire. They come in an official white color that you can use on it's own, however if you would like to give them some pizzazz, they can be easily painted. After discussing it with my husband who still wanted a dark color, we decided to leave the overlays white and attach them to the dresser thereby making it a black/white dresser. Now all I have to do is find drawer pulls that will complement the dresser and it will be complete! It does help to discuss things over with your significant other. I have a habit of changing my mind quite frequently. So what if I decide that I no longer want a blue bedroom? Then the white O'verlays® won't need to be changed. While you can make the O'verlays® permanent. It all depends on what adhesive you decide to use. Since I wanted a permanent fix, I went with Gorilla Gel Glue, but O'verlays® also recommends using Liquid Nails. They can also be trimmed to your desired size but if you're looking for custom sizing, that's also available too. If you're looking to spruce up some furniture that you have laying around, or just don't want to spend money buying new ones, consider O'verlays®. They currently ship not only within the USA, but to Canada and internationally as well. And for AnnMarie John readers you can get 15% off your order by using coupon code ANNMARIEJOHN15. Code is valid for one year so there's time to shop, but don't wait too long, and be sure to tag me and O'verlays® in your updates on social media. *Note - My dresser and nightstand aren't completely finished. I'm still looking for the perfect drawer pulls to make them complete. When that's done, I'll be sure to update the photos. I love these ideas. What a cool way to give your furniture new life without having to do a ton of work. So awesome. I agree and it also works out a whole lot cheaper than having to buy new furniture as well. I have so many plans now for the other furniture in my home. I love this idea! Seems like it would be very easy to do and I love the collage over the bed. Great idea. Oh it is super easy to do. I can even begin to say how easy. Thank you about the collage. I originally wanted to just post photos of me and my husband, but opted instead to do photos of the entire family and I think I made the right decision. Your room looks aboustly fantastic! Everyting comes together so well and those O'verlays are so awesome! I never knew a company as such existed. 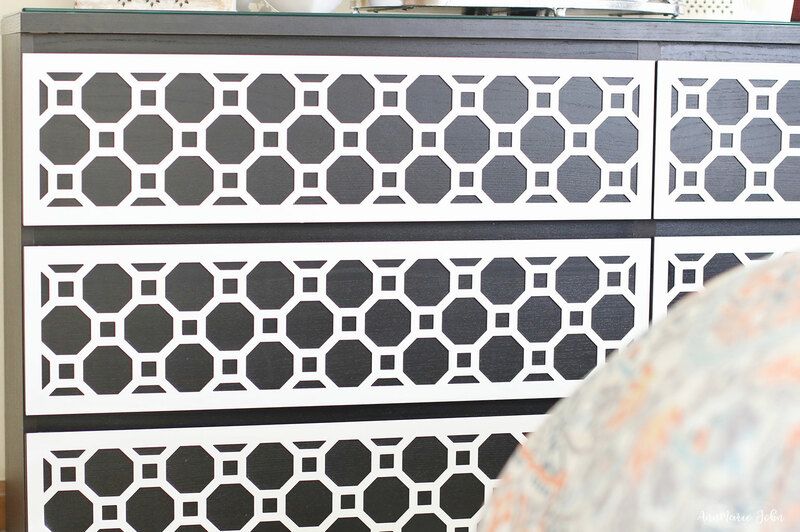 I think your dressers would look awesome with drawerpulls. Hopefully you will find some soon. Thank you. I think it did come together amazingly well myself. Since my theme is blue and silver, I looked into getting some blue/silver knobs but couldn't find any. Then I thought about getting some crystal ones but couldn't find any that I loved. I'm still searching and hopefully soon I'll find ones that says "you gotta buy me". Oh my goodness!! I've been waiting to see your room update ever since you shared that sneak peek on IG and I have to say that I'm impressed. I remembered when you lived in Brooklyn and you did the kids room, that was fantabulous, but this one is so beyond that. I don't have any IKEA furniture but I do have an old dresser that I was going to repurpose, but this is such a better idea. I'm saving that coupon for when I get some extra cash and can figure out which one of those O'verlays design I want. You did an amazing job!! Thanks girlie. You know how much I love IKEA. If it wasn't for IKEA, I'm not sure the kids room would have looked as good as it did. When you don't have a ton of money and still want to look like you do, then IKEA is the place for you. Add that with O'verlays and you've got nothing to lose. It sounds cliche', but, I love what you did with the place! And you did it with not too much hard work and sweat! I love your bedroom! It turned out beautifully! I love the the overlays! Thank you Nikki. I’m in love with them myself. I ironically had the toughest decision in regards to which overlays I wanted, but I have to say that Ruby won me over and it was a wise choice. 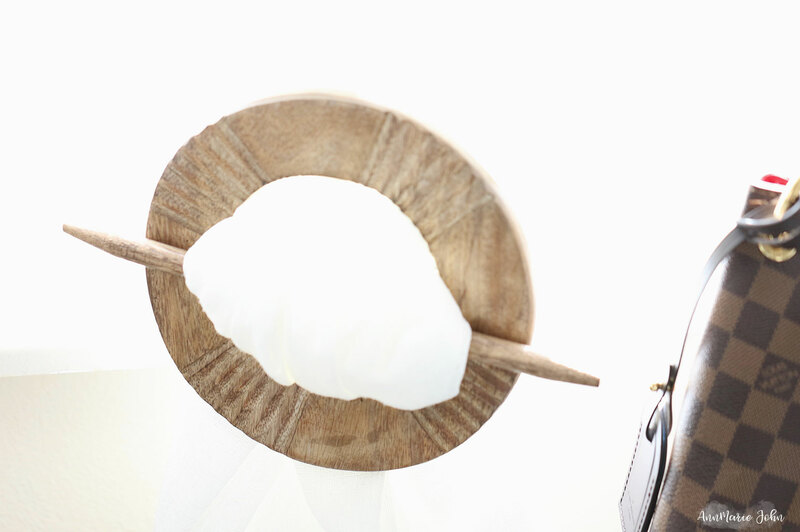 They really are amazing and they transform your furniture into pieces of art. I am truly surprised myself at the transformation, and best of all it was so easy to do. Those overlays look amazing! I would have thought they would be super tricky to add to a room so it's surprising to hear it's so easy. Oh no, not at all. They’re one of the easiest that I’ve ever done. Even if I had painted them blue or silver like I originally wanted to, they still wouldn’t have been difficult to do. Overlays are so cool. I can think of so many projects I would love to create with them! And there is a LOT you can do with them. My next project is my master bathroom and I plan on doing my mirror with it instead of replacing it completely. I love what you did with those O'verlays and it made those plain drwers look so good. I like my furniture but I have to do something in the kitchen maybe O'verlays can help. Oh it can most certainly help with your kitchen makeover. There is so much you can do with O'verlays! 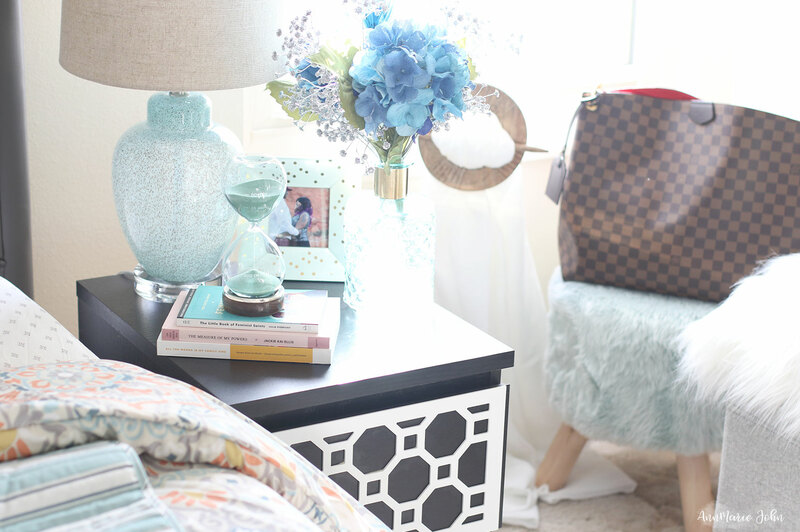 I absolutely love your bedroom redesign! 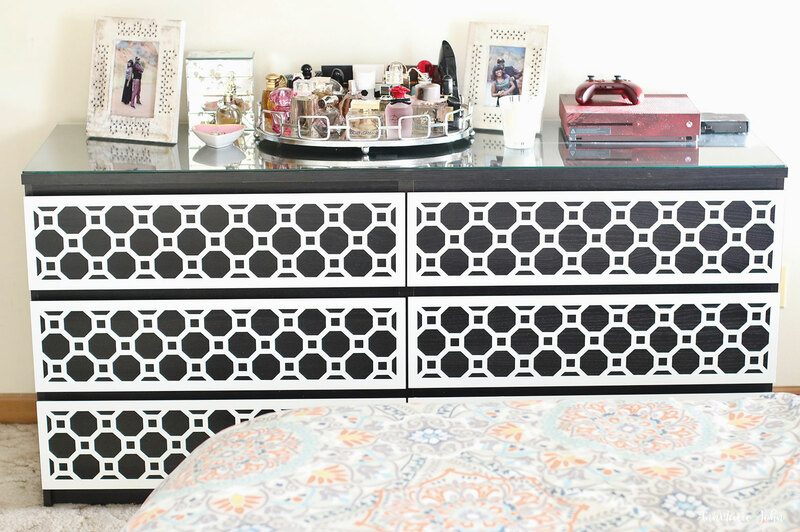 The overlays are awesome and I have the exact same dresser and it so needs a touch up, overlays would be perfect. It's amazing how little changes can make such a difference! Yes it can! The Malm dresser is one of the most popular IKEA dresser and most people purchase it. I also have a Brimmes that I want to do as well. I really love these ideas. As I was looking around the room, while reading your post, I saw several furniture pieces that I'd love to give a new life too. And it would be amazing to see what O'verlays can do for them. I hope you're able to give life to a few of your own. Your bedroom is lovely! I love all the blues you have added as well as the gray bed frame. 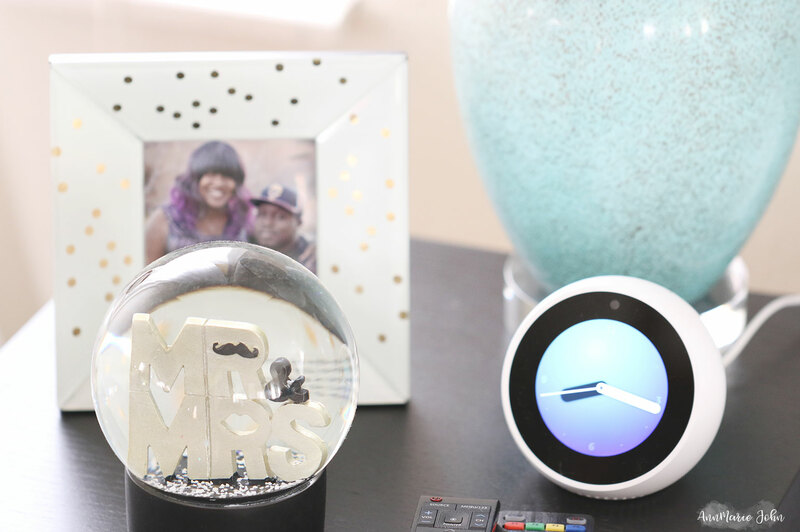 The Overlay's really added a new pop to your already beautiful room. Thank you Gladys. I fought my husband on the gray bed because I really wanted white or linen, but I'm happy he won because it did come together nicely. Wow, you did a great job and I love how everything came together. The bed (gray) color was a great choice and the picture collage was an added bonus. I do have some older furniture that I was plan on painting to spru them up, but I may use Overlay products. Thank you for sharing and I and looking foward to seeing more of your decorative skills. Thank you Shevvy. I originally wanted to paint the drawers on the dresser white and leave the frame black, then paint the O'verlays blue, but I think it came together well the way I left it. Now as soon as I find the perfect drawer pulls it'll be perfect. Oh this is beautiful! I love all the little details! They all come together so well! Thank you, however, if it wasn't for the O'verlays I'm not so sure it might have looked as good. My original plan was to paint the drawers but I'm glad that I left it as is. Oh it looks so much better! I really like it. Currently our bedroom is drab and boring. When it comes to home decor my husband lacks all knowledge and just doesn't care. He has a box fan on a giant plastic bin next behind the bed. That does not in anyway make that room feel special. We'll be working on it at some point this year. I love how much life your bedroom has. It's really good to go with one accent color to compliment the other colors that you'll be choosing for the room. It also looks Spring ready! Love all the colors that you have in your room as well as the decor! Thank you. I decided on blue and focused my look around that. Also wanted silver accents instead of gold. I'm very happy with the way it turned out. Wow! You are a natural. Such great taste in decorating. Your choices in colors and items are exquisite. The gray bedframe is a favorite. Yes they are! And thank you. I originally wanted to just focus on adding pics of me and my husband but since I have a family I decided to do a collage of all the kids as well, especially since my oldest son will be leaving and we'll now be down to 2 kids in the house instead of 4. There are times when I can't wait for them to be gone, but I know that I'm going to miss them. Luckily, I have lots of time left with Madison. What an amazing job. Your bedroom style is light and airy. The Overlays were a perfect addition. Thank you, I really tried with this one. When we bought our home a few years ago, my priority wasn't our bedroom so it was really boring. I'm glad that there are products like O'verlays that can help. I think you did an incredible job! I really can't wait to do this to my room. And I would really love to see the results when you do. I think it will look great no matter what you do, whether you keep it all white like me or paint them. Your bedroom looks so cozy and inviting now. I really love how those Overlays added a lot of character to older pieces and made them look new again. What a wonderful way to breathe new life into old furniture! Awwww thank you. Maybe it's too cozy and inviting because now my youngest, Madison, wants to come in and sleep in my bed all the time. 😂 And I have to agree, without O'verlays I don't think it would have looked as good. Wow!! You really did a great job updating the room! I love the drawers a lot. Excited to see what drawer pulls you will buy for them. Thanks girlie. You know you were getting behind the scenes sneak peeks lol. I'm still unsure what to get. I originally wanted to get something with blue in it, but my husband saw some crystal ones that I think would also be great since it'll be neutral and would be able to go with everything one we update again. We'll probably have to chat this weekend and you give me your insight. What a nice idea! I think I will have to check on this and spruce up my dresser and bedside tables. If my sons find it cool, I will redo their room too. That would be awesome! It doesn't hurt to give it a try. I'm actually planning on giving my kids room an update as well since they all have IKEA dressers, except for Madison so hers will have to be custom sized, but I'm excited. Oh wow!!!! I love the final look. And these seem so easy to use! My oldest daughter's bedroom could use a refresh, I might have to get some overlays! I personally think you can't go wrong with O'verlays. You might just want to get her input on which design she wants. It took me a while to figure out which one to use. I'm happy with the one I chose. I Love the overlays! I seriously thought it was a whole new dresser set. I Love how your room turned out. But tell me, where did you get that frame for the photos?? It does make it look like an entirely new dresser which is what I love about it. No need to do anything else at all. I was able to pick it up at HomeGoods. 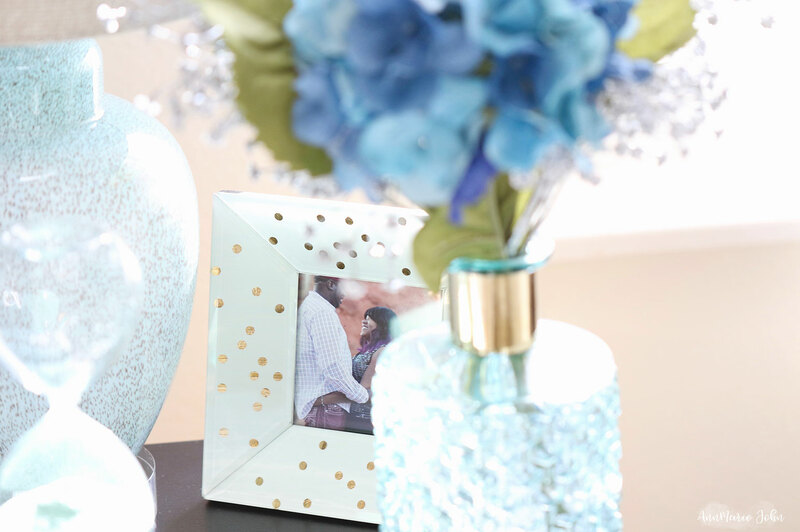 Most of my decor was purchased at HomeGoods, including the lamps, frames etc. I just LOVE that store! I really am loving the black and white design, that is perfect and really stands out to me! I also love the sand timer, hour glass I guess you can call it? What a beautiful new makeover, I know I would be very enticed to stay in that room all day long. 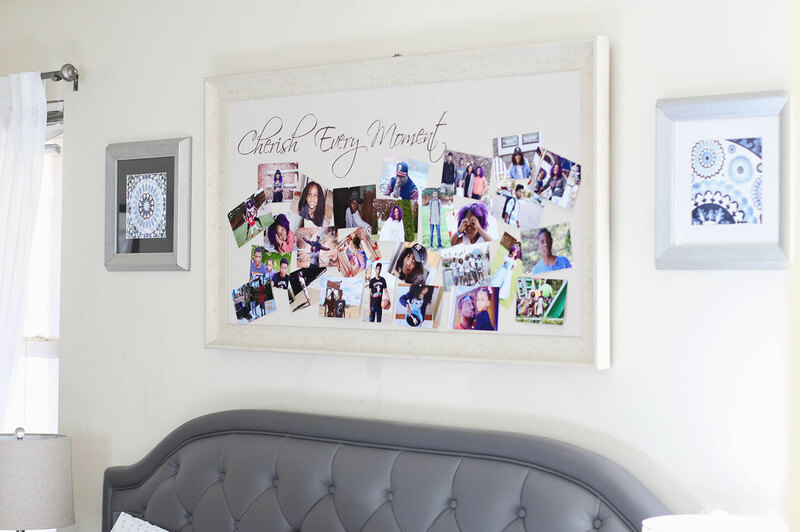 My favorite part is the photo collage, what a great way to capture memories and happy moments. 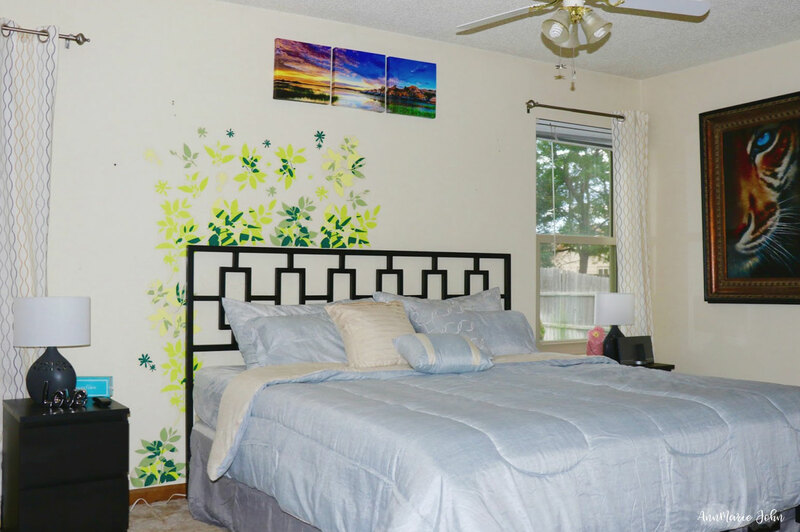 Your master bedroom makeover is AMAZING girl, glad you shared it! Thank you Brandy! ❤️ My intent was to paint the drawers white, leave the frame black and then paint the O'verlays a Tiffany Blue color but my husband the wise one said "what if you decide to change the theme from blue", then I'd have to do it all over again, so we stuck with the O'verlays white and just added them to the dresser for a black/white finish. 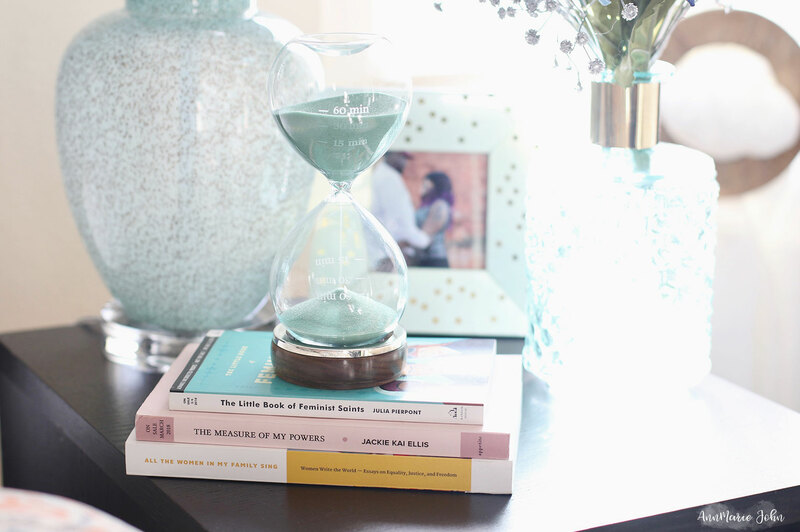 That hour glass is the most expensive thing in the room and was purchased at Tiffany, everything else I picked up on different trips to HomeGoods. I now have the master bathroom to finish and will be updating with that. I plan on using O'verlays with that too! I haven't heard of these before! I would love to give it a try. I love how it really added interest to your room. They're really amazing and so easy to use and customize as well. I think you'll like them. They're also not expensive. Overlays are a great tool for designing and making things colorful and more interesting. It brings out the color in everything. O'verlays are truly an amazing product and I'm so happy that it was invented. Now I can breathe new life into old furniture without getting rid of them. Absolutely love the make over. The room looks so airy and tranquil, those colors are perfect. Thank you. It took me a while to get everything together since I was really picky on what I wanted, but I'm happy it all turned out OK.
Those overlays are really awesome. They gave your drawers a modern vibe. I will have to check them out too and see what other designs/colors they have. Thanks for the information, and by the way, your bedroom looks lovely! Thank you, and I have to agree that O'verlays are awesome! They have quite a few designs, but they all come in white, you then have the option of repainting it to whatever color your heart desires. This turned out so great! I am always looking for easy ways to give my room a makeover and so I need to look into this. And O'verlays sure is an easy way to give your room a makeover, and best of all it's going to look amazing! Good luck! This is such an awesome design. I really like to see how people do their bedrooms so that I can get some ideas! Oh I do the same thing too. I generally use Houzz, HGTV and even IKEA to get ideas on how I want my rooms to look. I love these tips! 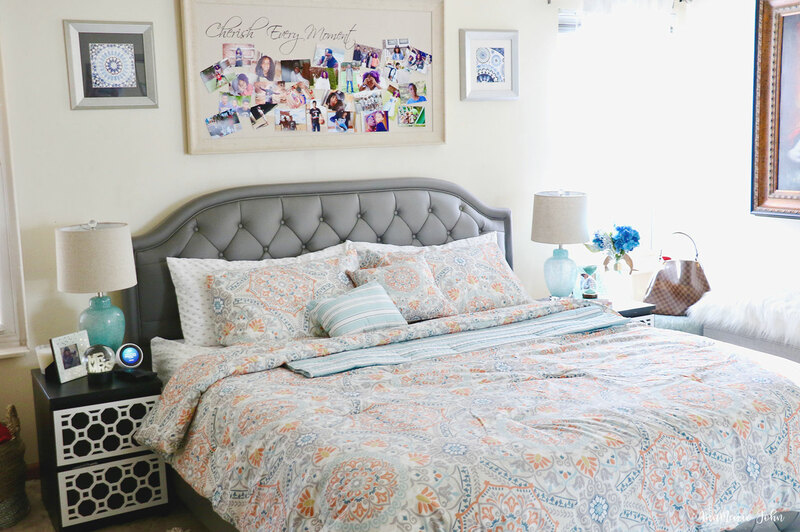 Your bedroom makeover is gorgeous and makes such a huge difference! Thank you. There are still a few things that I want done, but for now I'm just focused on my master bathroom. The bedroom update looks great! I like how you and your husband compromised on color since he liked dark colors and you wanted white. The blue tones look fantastic in the bedroom! Thank you Liz. Yes it was a struggle at first. He wanted to keep it black, but I wanted white or as close to white as I could so that it would look even more roomier, but turns out the blue was perfect. Love this! We are about to embark on our master bedroom makeover so this comes at a perfect time for me! Making over any room can be so stressful at times, but I hope you're able to get it exactly the way you want to. Good luck! This came out so pretty! I really love the overlays! We are working on doing some home makeover projects and our master bedroom is next up on our list. Thank you! O'verlays sure make such a big difference, and would make a great addition to your master bedroom, especially if you're not planning on getting rid of your furniture. My girls want their bedrooms madeover. This would be a perfect way to change the look of the room and their furniture. Yes it would be. My 5yr old wants her dresser done as well and I'm letting her choose her O'verlays and drawer pulls to bring it together. 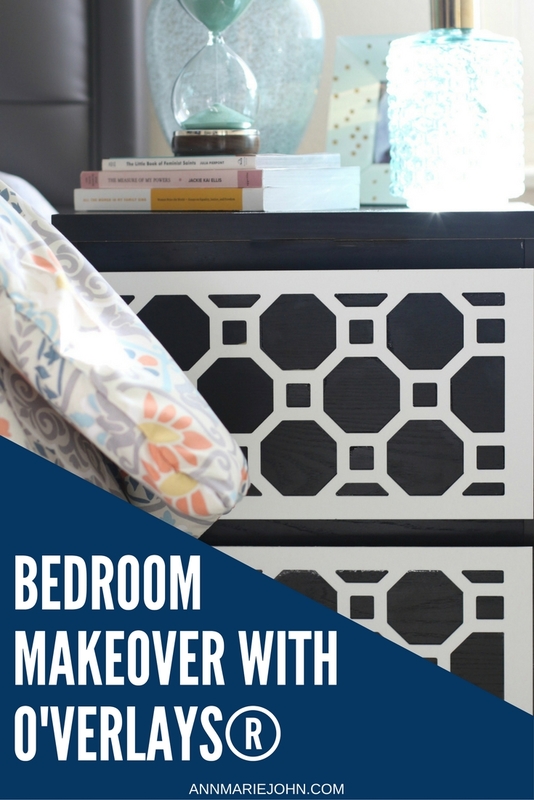 Here's to your girl's bedroom makeovers! I haven't heard of these before, but what a cool idea! It sounds like a great way to change things up. I love your idea of the white and tiffany blue - that sounds gorgeous! And I just LOVE that hourglass. Thank you Stephanie. 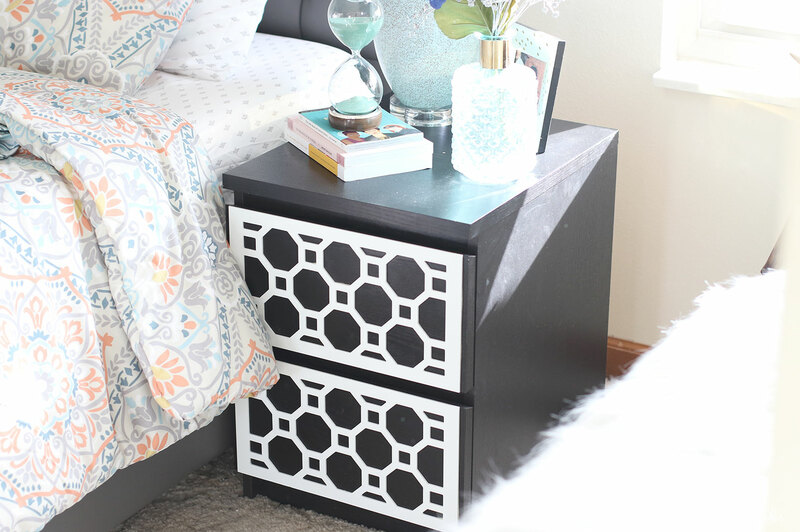 O'verlays is a great way to change/dress/update the old furniture in your room. I'm a big fan of Tiffany and just had to have that hourglass. Oh I love how it turned out! Those overlays are so pretty. Thank you, I even impressed myself. I'm a big fan of O'verlays and couldn't wait to share them with everyone. They can sure make your old furniture pop. all the little details make your room your own. It looks so beautiful! Thank you Kimberly. Since I'm the one who has to look at it on a daily basis, I wanted something that not only looks great but that will make me feel comfortable in as well. I love what you’ve done with this room so much! Our room is in desperate need of a makeover! And what better time to do it than now. I love the term "seize the day", so get to it and let O'verlays help you. Wow, your room really came out beautifully! I think it might be a little modern for my taste personally, but I was surprised by how much I genuinely liked the graphic aspects. You seriously have an eye for decor!! Wow, that's a BIG difference. It looks amazing. I think with us doing our renovations right now, it's finally time for the fun stuff - like decorations and overlays. I love the way they can transform the room. Oh they can certainly transform a room, that's for sure. I am really impressed with the final results myself too. Don't forget to use your coupon if you decide to use O'verlays. WOW, AnnMarie, I LOVE how it turned out. The Overlays, definitely added a bit of sophistication to your room. But, the overall theme of the room says calm and peaceful. I also love your headboard!! Awww, thank you. I love it myself too and I agree, the O'verlays sure did add that sophistication that I didn't have before. I feel so much better in my room too. The darker colors was a bit dreary and the lighter colors makes it feel so much more relaxing.